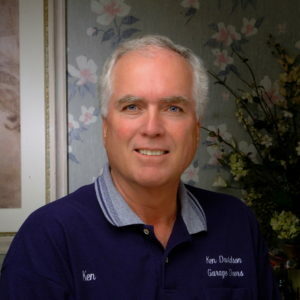 Ken Davidson Garage Doors In my 54 years as Ken Davidson Garage Doors Repairman, I have performed over 150,000 garage door repairs and built and installed many thousands of Garage Doors and openers. That qualifies me as an expert in this field. People have called me O.G. That is Old Gangster in the Gang Speak, but in my case it means OLD GARAGE DOOR REPAIRMAN. Even though so many years have passed, I still enjoy working and figuring out problems, so this is not just a profession, it is a labor of love. God has blessed me and given me a wonderful family and at this stage of life, I’m very happy and thankful. My guiding principle in business has always been EXCELLENT CUSTOMER SERVICE and 100% GUARANTY ON MY WORK. I do SAME DAY SERVICE and FREE ESTIMATES for all garage door repairs. I can respond immediately when you have a Garage Door Spring Repair problem. A broken or weak spring is the most common reason your door stops working. If your garage door ever goes off track, stop operating it and call us immediately. The springs, cable, and hardware system are under tremendous tension and must be properly counterbalanced before beginning any repairs. Attempting a DIY repair could result in serious injury or death. After spending hours trying to repair it yourself, you will probably have to seek professional help. It is always wise to call an expert when there are issues with your garage door. Our emergency repair services are available 24/7. All you need to do is call us and we can usually be at your door within minutes. Every homeowner knows that garage door problems always seems to occur at the most inconvenient time. If you are based in the Inland Empire, you can always call Ken Davidson Garage Door Repair Service. Here, we provide 24-hour garage door repair to deal with door issues. By using our emergency garage door repair services, you can prevent injuries and also more damage to the garage door or opener. Does your Door Look Like This? There are many reasons a garage door could come off track. The main reason is that your springs have either grown weak from use or have broken. In the event your door comes off track, call Ken Davidson Garage Doors. Before attempting to use the door again. 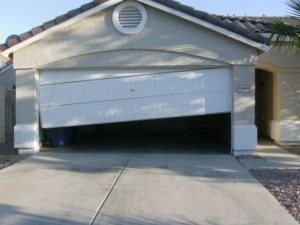 Doing so could be the difference between being able to repair or needing to replace your garage door. Ken Davidson Garage Doors is ready for immediate response when you have a Garage Door Spring Repair problem. PROFESSIONAL GARAGE DOOR SPRING REPAIR Ken Davidson Garage Doors offers a variety of garage door openers, remotes, and entry systems. We also provide garage door opener repairs on all brands. We therefore have garage door openers that are available for every residential application. the Inland Empire, with hundreds of successful projects, we will be happy to help you. Looking for a gate repair company in the Inland Empire? You are in the right place! We can fix all kinds of doors. A problem with your gate does not mean that it is time to get a new door. Because a good gate technician can repair almost every gate problem. Ken Davidson Garage Doors specialize in all kinds of gates repair in the Inland Empire, and we will be happy to help you with your gate problem. Facing a broken opener can be very unpleasant experience, and can lead to a lost of money and time. Just think about yourself coming back home from work, or on your way to work in the morning, and the door doesn’t open, which mean you can not leave or get inside. That is the reason why we provide a 24-7 gate repair service in the Inland Empire and We will always be there for our customers. If you own a business, and your rolling door doesn’t open in the morning, or doesn’t close at the end of the day, you know that it is time to call Ken Davidson Garage Doors, emergency roll up gates repair service. We offer all kinds of gate repair 24/7. Whether your rolling door is stuck, broken or if you need a new new opener installation, you got to the right place. call us and one of our gate repair technicians in the Inland Empire will be happy to help. One of the reasons that can prevent a rolling door from working, is if the gate went out of its tracks. There may be different reasons why the door went out of the tracks, but all of them have one thing in common: You should not try and use the door if it went out of the tracks, and contact a roll up door contractor in the Inland Empire to repair the problem. Repairing the door may involve parts replacement, or some welding work, but the important part that when the job will be completed, the door will work again.